Yesterday was the third annual Ocean Games in Ocean City, Maryland. I took part in the nine mile ocean swim. It is a point-to-point swim starting at Caroline Street and ending at 145th Street. There were some two dozen of us who took the plunge for the marathon swim — others did SUP races or a three-mile or one-mile swim. 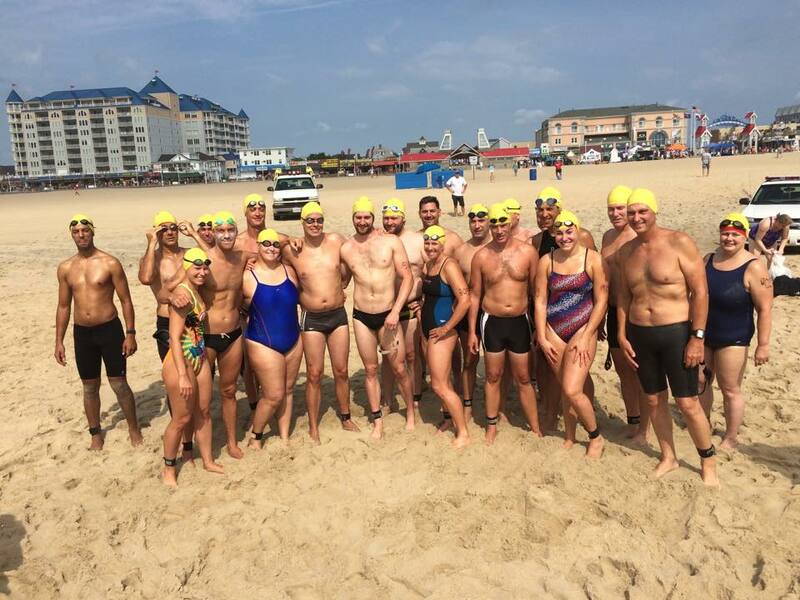 This is the crew that swam the length of the barrier island (the Maryland segment) where Ocean City is located. A pretty happy bunch before the swim start. Paddy was my kayak pilot. Ironic considering he doesn’t like the water — but what good is staying friends with someone you met at age 18 if you cannot drag them along on adventures? He was able to launch into the surf without dumping over, rode without incident for the whole race, and kept me fueled while I was out on the course. Looking back, it could have been a real mess with the two of us. He has been on kayaks, but isn’t an experienced ocean paddler. I know how to swim, but I had zero experience with what we were getting into. It all worked out however I’m pretty sure we had some of the slowest feeding sessions among all of the swimmers. I finished third overall behind a 40 year old man and a 22 year old woman who pipped me in the last mile. She had it when it mattered; I did not. I finished in 3:22:04.4 which is about a 22:27 per mile pace. 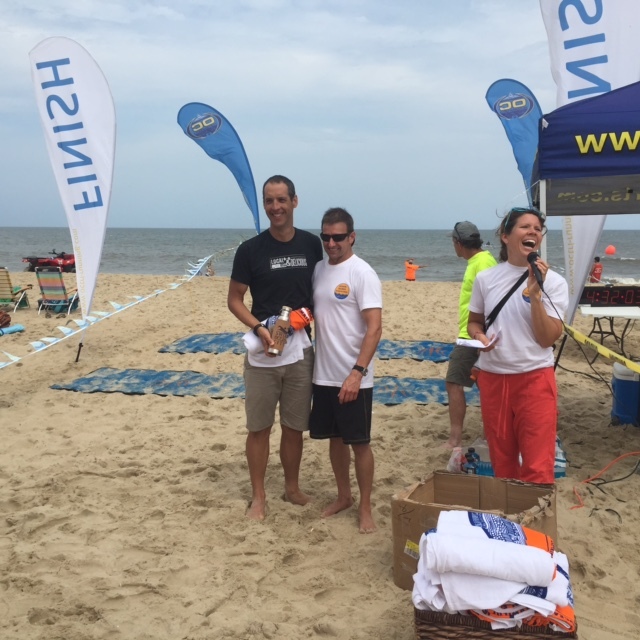 Top three finishers were given a cool water bottle and a very nice beach towel featuring Ocean Games logos. Here I am with the event’s founder, Corey Davis, who organizes the whole thing to benefit the Johns Hopkins Brain and Stroke Rehabilitation Center. The day was very pleasant. We had a 10.00 a.m. start with light, steady breezes that grew into a steady 12 mph wind from the south. As a result, we had a tailwind pushing us down the course and the water became increasingly choppy as we progressed. We stayed at a Hampton Inn at 43rd Street which was a short walk to the Friday night check-in and safety briefing. In the morning, for $3, I took a bus down the main road to where the numbered streets begin to walk about two or three blocks to the race start. The pre-race preparations went smoothly probably due in part to the later start time. I’m not sure if that was to accommodate the live guards and when they go on duty, if it is because of the tides or what, but 10 a.m. is luxurious compared most triathlons that go between 6.30 and 7.30 a.m. I prepared nutrition as if I would be swimming for 5 and a half hours, then I included another hour of stuff in case things went way off my plan, and then I threw in a few things as back ups. I had way more than necessary on board the kayak and possibly more than necessary in my gut. A bus ticket and public transit was the simplest way to get to the race since Paddy had to go early to pick up a kayak and get a second safety briefing. I’ve read about ginger being good for seasickness so I made a cup the night before, put it in one of my “back up” bottles for the race and then iced it down. I also had a cup for breakfast. I was aiming for 75 to 80 grams of carbohydrates per hour. My objective was to come up with a plan that would be simple to execute. Fewer choices, fewer variables, fewer chances to make a mistake or combine two things that don’t go together and if something was off, it should be easier to isolate the culprit for next time. My plan was to drink half bottle on the 30 minute mark, drink half a bottle and eat a Gu Roctane gel on the 60 minute mark, and then repeat. In addition, at 120 minutes I planned to chew up a GasX tablet to help with all the gels. For the first, third and fifth bottle I had Gu Roctane Endurance drink powder in a Clean Bottle. For the second and fourth hour I had Gu Bru drink powder (I could only find the low-calorie/carb version so I tripled the concentration) in a Tri360 bottle. All the drinks are made primarily with maltodextrin as the base carbohydrate. Items in the “extra” or just in case category included two regular Gu gels, a bonk breaker, a single serving bottle of Scope, Cliff Shots which are nutritionally like a gel but packaged as gummie chews, the bottle of ginger tea and a bottle of Gatorade Endurance. Next up I write about how the race developed — there was a lot more action and movement within the field than I expected — and what I learned. I learned a lot. Open water swimming is a prerequisite for marathon swimming, but the two are not at all the same thing. I’ve done the former and enjoy it tremendously. The latter is a whole new world and I’ve only just begun to earn some understanding of its mysteries — understanding that must come through experience. From what I’m told, marathon swimming is a prerequisite for channel swimming which is on a whole other plane. Teasers — I swam in the lead or with the leader for almost 90 minutes, donated some of my breakfast as fish food, was passed by two people simultaneously around the seven mile mark only to pass them both back — temporarily. Also, everyone I met was very generous with their advice and in answering my very naive questions about everything from what type of bottle to use (I used standard bike bottles) to pacing and other race options.